Vice President Binay is being asked how he will reconcile his having fought the Martial Law regime of President Marcos as a human rights lawyer with having Senator “Bongbong” Marcos as his running mate. His answer is: 1) Martial law is no longer an issue; 2) Bongbong is not President Marcos; and 3) that it is now time to move on. He must have loved answering that question because it implied that it is the Marcos name that is anathema to the voters and not the corruption and plunder charges that have been filed against the Veep. If not for the billions of pesos Binay, or rather, the city of Makati has already spent on municipalities and cities all over the country in the guise of a sisterhood relationship between these Local Government Units and Makati, Binay would be politically dead by now. But he is still a political force to reckon with despite the numerous testimonies of witnesses shedding light on the allegations of plunder against him. The money already spent on his campaign coupled with the war chest he still has at his disposal that is formidable, to say the least, is what is keeping him from being “knocked out” of the race. It must “pain” him to have to run with Marcos but not because it offends whatever values he may have which is nil, but because he will have to relegate to the sidelines, one of his many fake “badges of honour” which, in this case, is his “human rights lawyer/freedom fighter” persona that is, at best, highly exaggerated — fabricated for the most part. So far, two of his disguises — “boy-scout” and “human rights lawyer activist” — have become difficult to wear due to the corruption scandal that has hit his family. He still has his “exemplar city government chief executive” image and his “poor boy who cares for the downtrodden of our society” persona to use in his campaign. But his “bag full of tricks” is fast getting depleted. 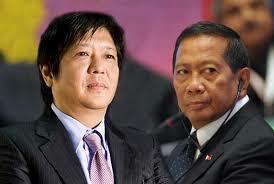 Truth is, it is more disadvantageous for Senator Marcos to team up with him than the other way around. Senator Marcos, in his more than two decades of public service, has never been charged with, much less convicted of, any malfeasance in the performance of his duties as an elected official of the Republic. Binay, on the other hand, has “corruption” and “plunder” written across his entire career in government from day one of his appointment as OIC of Makati including his Boy Scout presidency for over twenty years. It is Mr. Marcos that will have to do the explaining to his followers why he has agreed, if and when he does, to run along side Binay who claims the plunder charges against him are just politically motivated and baseless. But it is difficult to brush aside the long line of witnesses, experts, and whistle blowers that have already testified against him in the on-going Senate investigation where he refuses to confront his accusers giving more credence to the allegations made against him. So why is media, or some in media (his paid hacks? 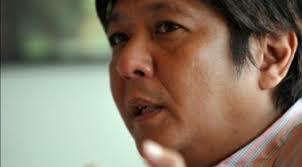 ), harping on Bongbong being “baggage” to Binay’s run for the Presidency? This scenario certainly gives the impression of a Binay up in a pedestal asking that people not pass harsh judgement on Bongbong as if Senator Marcos needed him to make excuses for his past. The Senator would be more credible answering criticisms against himself than Binay defending him; nowadays, Binay’s endorsement is like being blessed by the devil. It is, no doubt, a clever move on Binay’s part to have Bongbong on his ticket and one that only a shrewd and wily politician like Binay would concoct as a way of deflecting and replacing what should be the real issues against the Vice President — corruption and plunder. It is Binay that would be so lucky to share the stage with Senator Marcos, and the solid north will be one hell of a bonus he will be looking forward to. 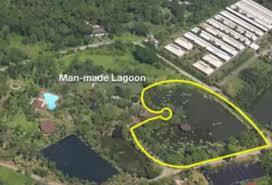 It would also do Mr. Marcos well to ask Erap a thing or two about Binay’s “junking” habits. 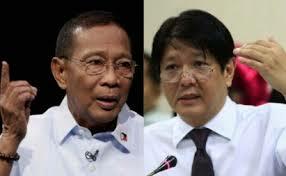 Should the tandem materialize, there’s a downside to this for the Veep that he may have overlooked: on stage beside the boyish looking Bongbong, he will appear to be older than the already 74 years old that he is — an image that the youth will have difficulty identifying with, in boy scout uniform or not. 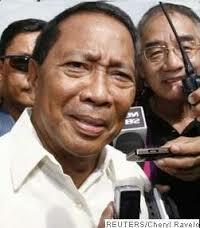 Next thing you know, Binay will be addressing everyone as “dude” and “bro.” Don’t be surprised.